◆The faux leather is coated with a film of PU ensuring durability and water resistance, easy to clean and maintain. 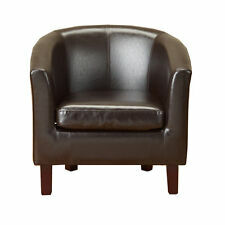 ◆Padded seat with high back ergonomic design, very comfortable. ◆Floor protection, anti-noise plastic feet. Simple assemble required. Modern appearance brings a contemporary atmosphere into your kitchen or dining room. 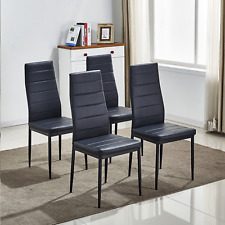 Special Features: Dining chairs, Kitchen chairs, 4 chairs black. Black anti-rust paint coated steel tube make you release of getting deformated/decayed. Grey Dining chairs--- ERGONOMIC DESIGN - The Coavas Dining Chair Fabric is dirt proof and with a confortable thick padding and Back. 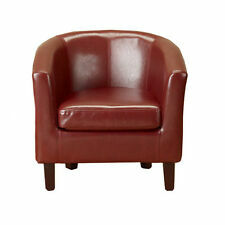 The Back of the Chairs fits your body Back shape for an optimum comfort while sitting. The dining chair provides a crisp, clean look to any kitchen or dining table. 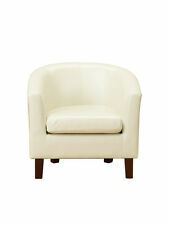 This chair is suitable for use with laminate and tiled flooring due to the plastic gliders on the feet. Dining / Kitchen / Office Chair Cushioned Design for Extra Comfort [Sold In Pairs]. Faux leather brown seat covers, with easily removable pads for recovering. Dare I say it, with a nice tin of chalk paint and recovering, this would create a whole new look. 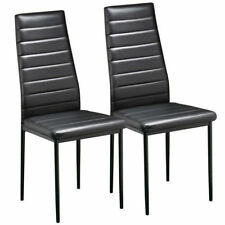 Set of 2 faux leather retro style dining chairs inspired by classic car seat design. 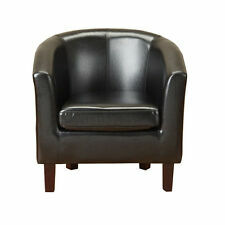 Hard wearing and easy to clean high quality faux leather gives these chairs a modern stylish appeal. High density foam padded seat and a solid back provide maximum comfort, with the tubular steel legs providing a strong supporting base.